strating the LipiFlow system and sister LipiView instrument (figure 1). The manufacturers TearScience were happy to demon-strate the system and subsequently treated Yodaiken with the objective of easing the underlying cause of his dry eyes. This changed the way in which he looked at the treatment of dry eyes. The LipiFlow and LipiView equipment was, and still is, not widely available in the UK and Yodaiken decided to buy both machines to give relief to his dry eye patients initially in North West England. As the Dry Eyes Clinic developed, it incorporated other technolo-gies such as BlephEx. This acts as a mechanical debridement tool of the lid margin (figure 2), and is often used as a pre-treatment option to ensure the best impact for LipiFlow. 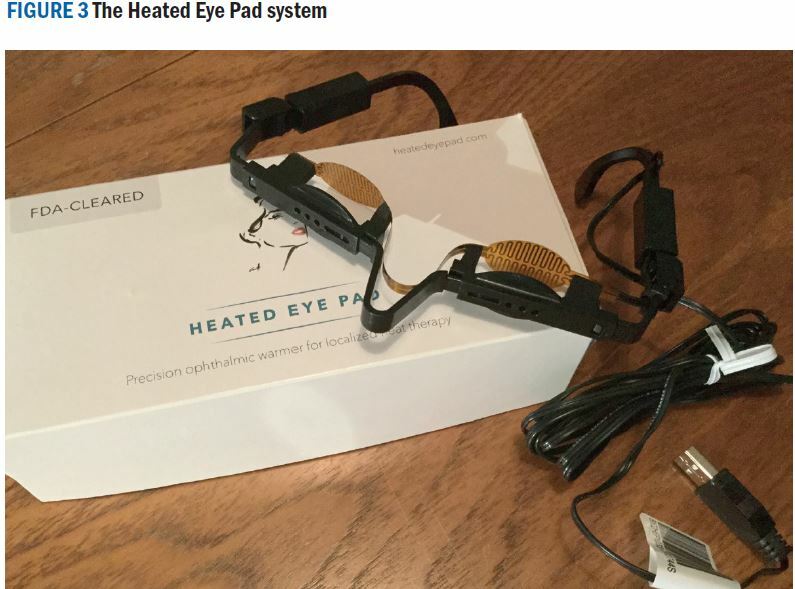 There has also been the use of Heated Eye Pad (figure 3 – look out for a review in a forthcoming article) a new American way to heat the glands which, when coupled with advice on possible diet changes, eye hygiene, blinking exercise, working time with screens and other choices has led to positive outcomes. 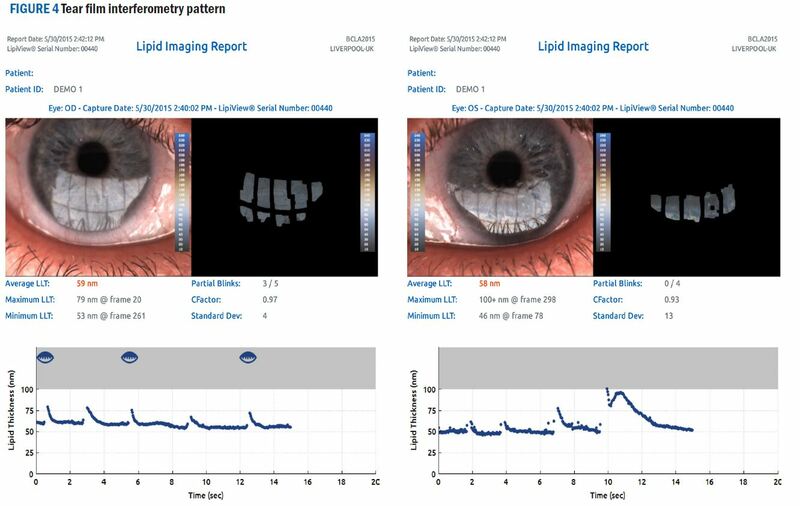 As optometrists and ophthalmologists became aware that the LipiFlow could now be more easily accessed and that patients themselves were prepared to self-refer, the number of consulta-tions at the Dry Eyes Clinic from further afield has increased. The clinics are committed to working with clinical partners to offer local expertise with access to this new technology. Dry Eyes Clinic has its base in Salford, but has recently opened two break-out clinics in North London and South London/Surrey to reduce patient journey times for treatment. Many of the patients attending clinics will have been pre-assessed by local clinical professionals. An estimated 86% of the 100 million dry eye sufferers worldwide have meibomian gland dysfunction (MGD),1 which stems from a deficiency in the oily lipid layer of the tear film. The lipids serve to protect the aqueous layer of tears and keep it from evaporating too quickly. Dry eye patients can be referred to the Dry Eyes Clinic for a full dry eye assessment. 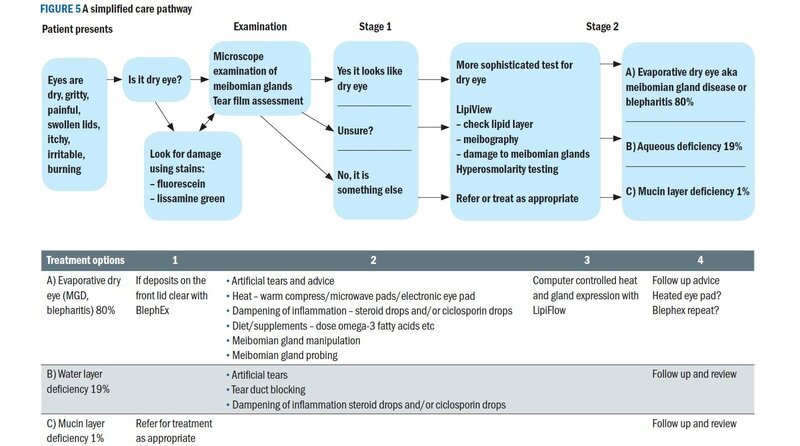 If a patient has evaporative dry eye, they may be a candidate for the LipiFlow treatment. LipiView II Ocular Surface Interferometer – this captures detailed images of the glands and tear film (figure 4). Meibomian Gland Evaluator – this evaluates meibomian gland function. LipiFlow Thermal Pulsation System – this treats blocked mei-bomian glands. A 12-minute in-practice procedure. Both eyes can be treated simultaneously. LipiFlow uses a disposable eye piece (Activator) to apply controlled heat to the inner eyelids and intermittent gentle pressure to the outer eyelid. In a randomised, multi-centre, controlled clinical trial, 79% of patients treated with LipiFlow reported an improvement in over-all dry eye symptoms.2 The period of relief for patients varies, but when there is a positive impact the effects last typically for a year or more. Indeed, some cases can gain relief for longer when the treatment is combined with ongoing good lid management. It should be noted that LipiFlow does not work for everyone, and the earlier in the disease progression the more likely treat-ment will succeed.. In some cases, due to meibomian gland damage, LipiFlow is not suitable as it is impossible to treat glands that no longer exist. WHAT ARE THE COSTS TO THE PATIENT? The treatment and a full assessment at one of Dry Eyes Clinic sites would cost £1,200 for both eyes. 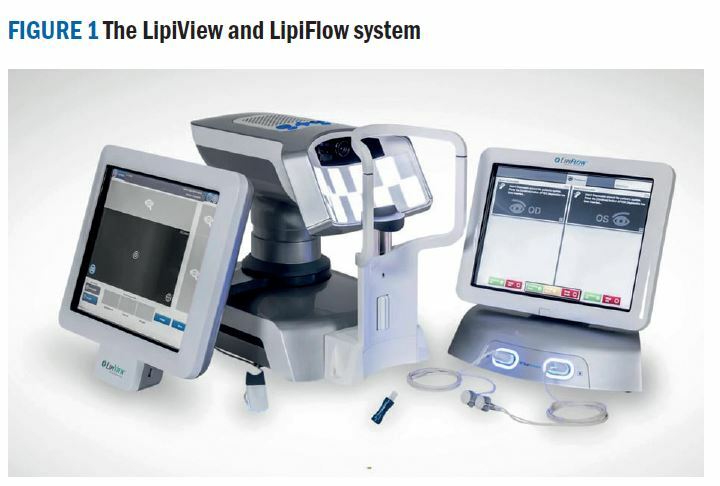 It should be noted that the costs reflect the expense of the LipiFlow/LipiView equipment, disposables (applicators are single use items), salaries of medical professionals, clinic overheads, partner optometrist’s fees and administrative support. HOW DO WE WORK WITH OPTOMETRISTS? Dry Eyes Clinics are acutely aware that business dictates that patients and customers remain with the referrer, and we agree with that principle. If an optometrist refers to Dry Eyes Clinic, we will ask the optometrists to fill in a referral form and agree to complete the follow up appointment on our behalf. We also request that the costs, suitability and chance of success are discussed prior to referral. Our optometrist partners are compensated for the assessment follow up and are given a full record of the procedure and discussions that have taken place with the patient at the Dry Eyes Clinic. The patient is then returned to the referring optometrist for ongoing care. This enables the referrer to be fully involved with the process and to keep the patient relationship strong. The Dry Eyes Clinic, where appropriate, is able to run treatments at the optometrist’s premises. Dry Eyes Clinic believes this model allows the patient quality treatment options led by the local specialist which then helps create loyalty based on service at the local level. See figure 5 for a simplified care pathway. Follow up appointments are, in the majority of cases, a straight-forward appointment that can be undertaken by the referring optometrist. On occasions that demand, the Dry Eyes Clinic would undertake follow up appointments and where necessary would advise additional treatment options. Dry Eyes Clinic is keen to discuss regional partnerships with optometrists to help create a treatment pathway for dry eyes. For further information, go to www.dryeyesclinic.co.uk. Blackie CA, Coleman CA, Holland EJ. The sustained effect (12 months) of a single-dose vectored thermal pulsation proce-dure for meibomian gland dysfunction and evaporative dry eye. Clin Ophthal. 2016;10:1385-1396.